Brian Buffini, a wildly successful Real Estate Agent and business man coined the term, “I’m never too busy for your referrals.” He grew his mega-million dollar business without spending a penny on advertising. Sounds quite absurd, as those of us who are Entrepreneurs value leads that are closer to the buying cycle even if we have to pay for them. The way Brian grew his business was buying small gifts for his clients, and “popping by” to visit in person. This was the best way he knew how to ensure he would stay top of mind with his sphere of clients, of which he relied on to produce the referrals he needed to continue to be successful. Let’s face it, when a friend or family member refers someone to us, we value that lead. It comes from a trusted source and we feel like the research has already been done. Real Estate transactions are normally few and far between, so it makes great sense that we do what we can to foster a great relationship with our clients long after the transaction. The last thing I ever want my clients to feel like is that they are just another transaction. Absolutely NOT! We have spent countless hours together, so why would I just forget about you after I have invested all that time? These tokens of gratitude that we take the time to make, then drive all over the Hampton Roads to deliver is a task at the very top of our list. 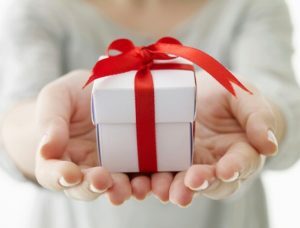 It’s not that we are trying to “buy” your referrals, but rather we want to connect with you a few times a year with a gift to remind you that you are important. You matter to me. I could invest a substantial amount of money in advertising, but why? I would much rather spend a few minutes building a small gift, investing a few dollars, taking a few days to deliver them, in order to see your smiling face and connect with you in a much more intimate way. It makes you happy and it makes me feel like if you or someone you know needs any help with Real Estate that my contact information will come to mind before anyone else. How often gifts are distributed varies with every Real Estate Agent. Some will pop by with gifts every month and some will drop gifts every quarter. I like to mix things up and implement gifts as well as events for my clients throughout the year. At the end of the day, who doesn’t like feeling valued and knowing they are someone’s priority?